This is a world in which the American Revolution went rather differently than in our own, and ended up creating a series of states across British North America all under the King to various degrees. These were Nova Scotia, Canada, the Commonwealth of America, and the Dominion of New England (revived to have some legitimacy and with New York as a balance to the more extremist Massachusetts). While the compromise was enough to stabilize the situation in the Americas, it did not calm all of the revolutionaries and dissenters. Those who were not happy with the status quo--a semblance of independence and more representation in Parliament but still definitively under the English--decided to move west. They first traveled to Louisiana and sought refuge there, but found that the best lands were taken or patrolled by the Spanish and the rest was wild and unsuitable for their agriculture. So, they headed west to the semi-mythical land of Oregon and eventually settled in what they called Providence Valley (what we call Willamette Valley). The capital, named Jefferson after their deceased former leader, served as the center of life for the new and small nation. The government created was one similar to the one created by the United States in our world, though leaning far more towards rights for farmers over the small but significant business class who began to trade heavily with Russian and Spanish merchants. Time passed and revolutionaries and radicals filtered in to the new liberal democracy, especially as the British continued to move west in the 19th century with the annexation of Louisiana. However, the biggest change came with the outlawing of slavery throughout the British Realm in 1831. Suddenly, American slaveowners and those in support of slavery were without some of their greatest resources and at odds with a powerful empire. Some chose rebellion, but the Commonwealth quickly crushed them. The rest decided to pack up their things and make their way to Oregon as best they could and create there a society in their own image. These settlers were largely evangelical in their religion and saw their arrival in Oregon as Biblical in proportion: a fruit of the teachings of the many religious men on the long road to Oregon. At first, the bands of trekkers were welcomed into Oregon, who was happy to increase its population. However, the number of southerners who poured into Oregon in the following decades greatly outnumbered the original settlers and began to transform the liberal democracy from the inside. By the late 19th century, Oregon was ruled by a reactionary government who retained voting rights for landed adult white men, but in practice it was restricted to the elites who had quickly expanded themselves on the farmlands of the Providence Valley and to the north, reducing many former landowners to tenant farmers on their own lands. Rebellions began to occur, and clashes with Native American tribes were frequent, including with those allied to the British in the West. Things would eventually come to a head in the 1890s with what is today called the Oregon Wars. This series of wars--really one long war with short breaks--was brutally fought between the independent-minded Oregonians and the British Empire who wished to extend its rule over Oregon and was supported, at first, by many inside the colony. However, the use of brutal tactics by the British including population transfers, camps to separate normal people from partisans, and relentless industrial warfare on the Oregonian military (a glorified militia) turned public opinion against the British as they struggled to subdue the massive territory of Oregon. By the end of the fighting, the pre-war population of around 220,000 in Oregon had been reduced by close to 50,000 killed and 30,000 deported to other British possessions as prisoners. Most of the dead were from disease and malnutrition due to the war's devastation, sickness running rampant in the land, and the conditions in the camps. Many of the dead were women and children. The international outcry against the wars resulted in the fall of the "old" Tories and restructuring of the British government and parties in Parliament. In addition, this conflict and subsequent annexing of Oregon into the Commonwealth of America as a province spurred on the creation of a constitution and the "Letter of Right" for the Commonwealth of America to form its own government separate from that of Britain, retaining only a select few aspects of British control and thus becoming, to a degree, independent. Today, the history of Oregon is taught throughout the Commonwealth as a multifaceted lesson of revolution, reaction, brutality, and war for the wrong reasons that continues to educate the youth of the Commonwealth for now and into the future. 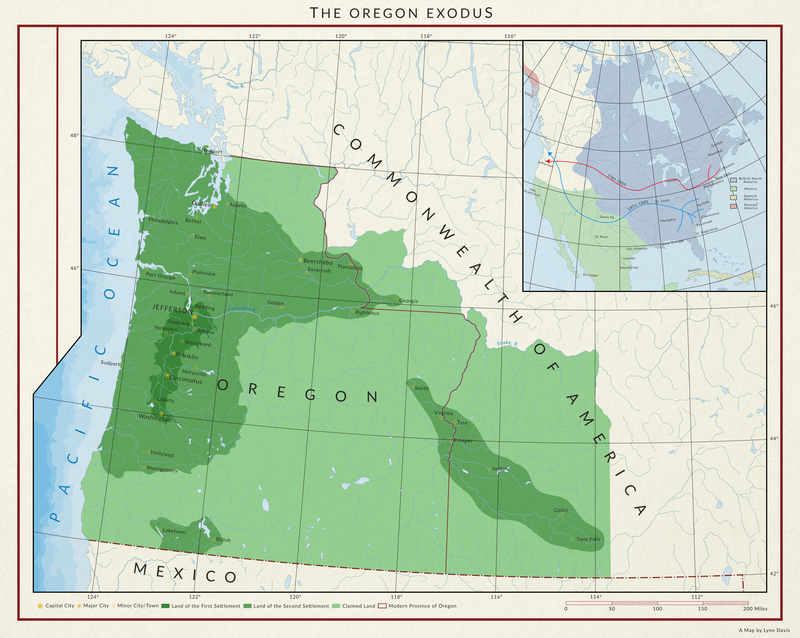 Oregon itself is today recovered, though much of the population descended from settlers who came after the annexation. The memories and scars live on from the halls of the Capitol in Jefferson to the gentle rolling hills of the Providence Valley, forever replaying a lesson hard-learned and signed in blood.